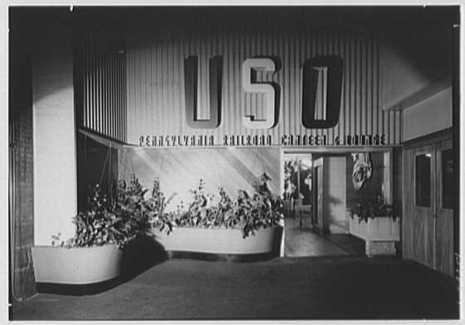 The United Service Organizations, popularly known as the USO, was chartered on February 4, 1941, in order to provide recreation for on-leave members of the U.S. armed forces and their families. The idea of coordinating civilian volunteer efforts on behalf of the rapidly growing armed forces was first proposed, in 1940, by General George C. Marshall. At the recommendation of President Franklin Roosevelt, the task was put in the hands of existing public service organizations. The USO, Inc., was organized by representatives of five private social service organizations: the Salvation Army, the YMCA, the National Board of the YWCA, the National Jewish Welfare Board, and the National Catholic Community Service. A sixth organization, the Travelers Aid Association of America, joined in March 1941. During World War II, the USO boasted as many as 739,000 volunteers and operated more than 3,000 recreational clubs. Set up quickly in churches, museums, barns, railroad cars, storefronts, and other unlikely locales, USO clubs were places for both lively social activities and quiet contemplation. Some came to dance and watch movies, others to write letters and find religious counsel. Perhaps the best-known center was New York's Stage Door Canteen, celebrated in the film "Stage Door Canteen" starring Katharine Hepburn and Groucho Marx. The Hollywood Canteen was one of the largest and featured entertainment by film stars such as Bette Davis, Marlene Dietrich, and Bob Hope. The United Service Organizations Inc. (USO) is a private, nonprofit organization that provides morale and recreational services to members of the U.S. military, with programs in over 135 centers worldwide. Since 1941, it has worked in partnership with the Department of Defense (DOD), and has provided support and entertainment to U.S. armed forces, relying heavily on private contributions and on funds, goods, and services from DOD. Although congressionally chartered, it is not a government agency. 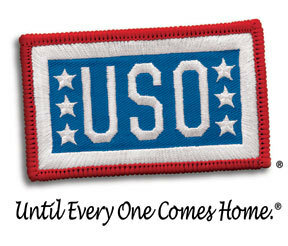 During World War II, the USO became the G.I. 's "home away from home," and began a tradition of entertaining the troops that continues today. Involvement in the USO was one of the many ways in which the nation had come together to support the war effort, with nearly 1.5 million Americans having volunteered their services in some way. After it was disbanded in 1947, it was revived in 1950 for the Korean War, after which it also provided peacetime services. During the Vietnam War, USOs were sometimes located in combat zones. The organization became particularly famous for its live performances called Camp Shows, through which the entertainment industry helped boost the morale of its servicemen and women. Hollywood in general was eager to show its patriotism, and lots of big names joined the ranks of USO entertainers. They entertained in military bases both at home and overseas, often placing their own lives in danger by traveling or performing under hazardous conditions - some losing their lives. During the 1990s it delivered services to 5 million active duty service members and their families and today "continues to be a touch of home to America's troops."